An 1895 fire destroyed most of Ridgefield’s business district. One of the big problems when the blaze broke out at corner of Main and Bailey was lack of water to fight it. That prompted villagers to create a water system that began operation in 1900. Spring fed and financially unstable, the system proved inadequate until Henry B. Anderson took over. With his help, Ridgefield entered the 20th Century with both village water and electricity. In the late 1800s Anderson built a summer home off West Lane in Ridgefield, using it a few years before selling it to Frederic E. Lewis, who enlarged it into a castle-like structure he called Upagenstit; the estate is now the Ridgefield Manor subdivision. Anderson built a second mansion on West Mountain, just across the line in Lewisboro, N.Y., overlooking Lakes Waccabuc, Oscaleta and Rippowam. Here he lived with his wife, the former Marie Larocque. However, when his wife died in 1903, he abandoned the house, which eventually fell into disrepair and was razed. Meanwhile, over his years here Anderson had been acquiring land on West Mountain and Titicus Mountain, winding up with some 3,000 acres; at least 600 acres were in Ridgefield and the rest in North Salem and Lewisboro. Anderson hired Eldridge N. Bailey, later a first selectman, to supervise building a network of roads through his property, with the expectation someday of selling sites for fancy summer homes and woodland retreats. His partner in this enterprise was Ogden Mills, secretary of the treasury under President Hoover. He also established the Port of Missing Men, a resort/restaurant on Titicus Mountain in North Salem with a spectacular view of the countryside. Many Ridgefielders, especially Italian-Americans, were involved in building the roads and operating the Port of Missing Men. With homes and so much land here, Anderson took more than a passing interest in the Ridgefield community and its welfare. A small water company had been established, laid pipe, and started operating in 1900, but almost immediately began having difficulties supplying water. “It was not financially stable and had not the capital to prosper and give the town an adequate system,” The Ridgefield Press reported. Two years later, when he saw the problems the town was having with getting decent water service, Anderson bought the Ridgefield Water Supply Company and immediately set about improving it, primarily by buying Round Pond on West Mountain to use as its main water source and building a standpipe on Peaceable Ridge to maintain pressure. The water supply needed electrical pumps so Anderson established the Ridgefield Electric Company to serve not only pumps, but also villagers’ homes and street lights. 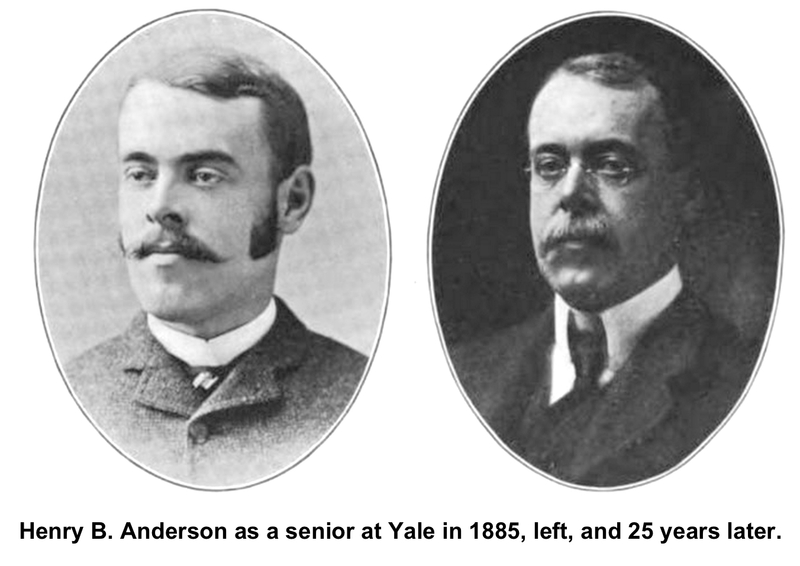 Anderson sold his controlling interest in the water company in 1928, and through several subsequent sales, it is now part of the giant Aquarion corporation. The electrical company continued for some years under different ownership until it was absorbed by a regional power company. 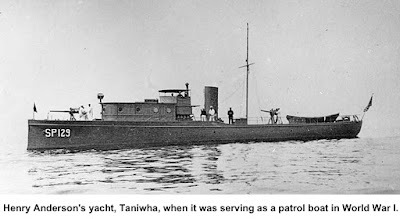 During World War I, Anderson offered his yacht, Taniwha, to the Navy. It was commissioned the USS Taniwha and was a Naval vessel from from 1917 to 1919. Anderson was at first placed in command and assigned to patrol the New York Harbor area, but he later worked in the office of the Chief of Naval Operations in Washington until the war ended. In his later years, Anderson spent little time in Ridgefield, though he still owned much land here. He had homes on Park Avenue in New York and at Sands Point, Long Island, when he died in 1938 at the age of 75.